Politicians at a UN climate conference in Bonn, Germany are refusing to discuss whether their polices will actually protect the climate. 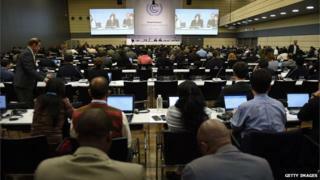 Nations have jointly promised to keep the global temperature rise below the 2C danger threshold. They are informing the UN how they will each cut their domestic emissions of greenhouse gases. But key countries are refusing to discuss whether the sum of these cuts will do the job. The EU, supported by African nations, wants to make countries face up to the fact that their collective cuts won't keep the climate within the 2C threshold. But China, India and Brazil are insisting that the national contributions should not be discussed at the UN until the main summit in Paris in December, by which time it will be too late for countries to negotiate any increase in ambition. The Chinese chief negotiator, Su Wei, said talks about the procedure for a new UN climate regime were going so slowly there was no time to discuss whether the emissions cuts added up. "It has taken us 10 days here discussing procedural matters and we have made hardly any progress," he told the BBC. "We cannot add any more items to the agenda to be discussed before Paris." Other nations blame China for orchestrating moves to slow progress in Bonn. Tasneep Essop from the World Wildlife Fund said the situation was "bizarre". "The aim of this process is to stabilise the climate, yet delegates are being prevented from even talking about it," he told the BBC. "We want a full science-based review of all the countries' intended contributions so the world's public can see whether politicians are keeping their promises. It is clear already that countries need to do more." China is expected to make its own climate offer to the UN in the next few weeks, and experts expect it to over-achieve on its promises. But as China is winning praise for its domestic actions it is accused of attempting to weaken international scrutiny. The tasks of planning domestic energy policies and negotiating a new international treaty are in the hands of completely different sets of bureaucrats. Michael Jacobs from the Global Commission on the Economy and Climate said the stand-off proves that countries' individual climate targets should be left flexible when they are presented at the Paris meeting. "It's clear the contributions should remain open to be raised between now and 2020. We can't afford for them to be locked in because we have to find new ways of raising ambition." Mr Jacobs, former climate advisor to Gordon Brown, said international co-operation over city planning, standards for buildings and machines, and aviation and shipping could help achieve deeper emissions cuts than already envisaged. "If Paris fails to deliver the 2C, there's a risk it will be written off as a failure. We need to avoid that happening to keep up global momentum on emissions. "That's why we need to keep the national contributions open in Paris." Why has the year 2014 been so hot?